Tiny Tower by NimbleBit has been on the app store best sellers list for some time now and only recently did I try it out. The game is clearly influenced by so-called social (Facebook) games and directly takes some mechanics from Facebook games for monetization, the question that always comes to my head when playing gaes like this: which came first, the plan for the game or the plan for how to make money. Either way, a good free to play game focuses on the play experience first and foremost. Only after the primary game elements have been figured out should the pay mechanics be factored in. * Essentially one should be able to play the entire game and enjoy it without ever paying a cent. The games that dont do that end up not being played for a long time or die in the market place. What about Tiny Tower then? Tiny Tower is similar to SimTower in that you build a skyscraper and you manage a couple resources as you build it. Tiny Tower is really simple when it comes to what you manage: money. 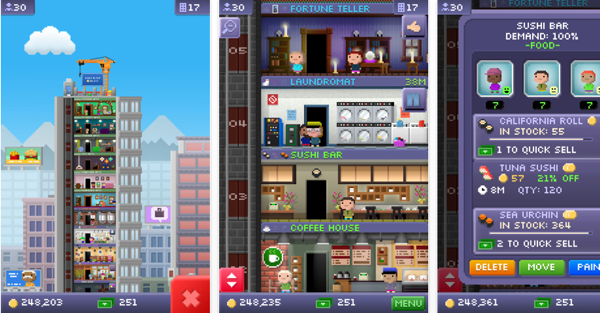 The money in Tiny Tower is handled like most freemium games with a ‘hard’ and a ‘soft’ currency. You can earn both in game, but the as always the soft currency is easier to get. Other than currency the only thing I felt I should care about was the happiness of my 8-bit tenants. Their happiness doesn’t matter because it’s not related to anything meaningful. The game gets repetitive – and fast. Somewhere in-between building floors 10-20 you’ve experienced everything the game can provide. This gives the player little incentive to keep playing, indeed the only thing that will likely keep people going is how many friends are also playing the game (thus the social aspect), but even that is unrewarding. The only thing that kept me playing as long as I did was the theme of the 8-bit world and their tongue in cheek tone throughout the game. For example, instead of Facebook the game has BitBook that provides insight into the tenants. It turns out that Tiny Tower is getting missions and soon. Perhaps I’ll update the game and try playing it again. *I am fully aware that there are always exceptions. There should be or talking about games would get boring fast.